Wallpaper - Where did you get the wallpaper? Love this paper, any idea where I'd get a similar one in the Uk? Brewster has a similar paper. Lovely! Pillow Sham - I love the scalloped sham! Who is the manufacturer/designer? Wow, I ADORE your mad design skills! Who makes this "X" Bedside Table? If it was custom, may I contact you? Thanks cvillian. Yes, they are custom. definitely contact me if you are interested in purchasing. Who makes the wallpaper and what is the name? I love it. where can you buy the end table? - where can you buy the end table? Lamp - Did you sell the lamps? What is the maker and name of the lamp, please. Hi bcar1414. I haven't sold the lamps yet. Contact me at emily@armoniadecors.com if you are interested. Beautiful lamp - Where can I find the lamps? Karen - Where can I have this nightstand made? If custom, name of manufacturer or individual or designer to contact? Where can I find the head board? The headboard was purchased at Grace Home Furnishings in Los Angeles, CA. Love the lamp! Where might I find it? Appears to be created from a vase from the 1940's - but you can find plenty of other vintage lamps on eBay. Lamps - Are the lamps available still? I like the 2 books on the night table. Title and author would be great! 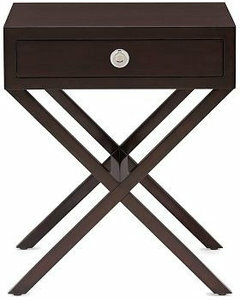 Nightstand - Love the design. Any ideas on where to get a nightstand like this? Coverlet - What is the source for the blue coverlet on the bed? Thank you. Bouquets. Fresh bouquets picked from the yard were paramount, whether on a bedside table or as a centerpiece on the bridge party buffet table. Plus, a big vase can cover up an L-shaped scratch. If it is a vase that captures your attention, have it retrofitted with lamp parts of your choosing. This piece is truly an original design and comes with bragging rights. Go ahead and pat yourself on the back.More: What Does Vintage Modern Mean?Houzz Tour: Cool and Collected in Downtown L.A.
6. Treat yourself to flowers. Few things perk up a room like fresh blooms. When working with more objects, look for a mix of heights. 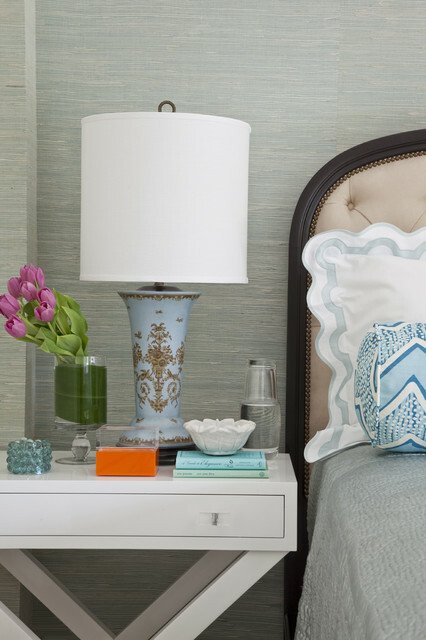 You may already have a lamp on your bedside table, which can kick things off with a dominant height. From there, look for short objects as well as a few in the mid-range, like the flowers you see in this picture. Elevate short objects with a small book. Have fun and play with your vignette until you get it right. Here are the basics: • Use books as pedestals.• Fresh flowers or foliage always, always looks good.• Include at least one bright, weird or unexpected piece (like the bright orange box pictured).• Place things at different heights (like books as pedestals). 6. A well-outfitted nightstand. Place bedtime comforts within easy reach: a carafe for water, a tray or bowl to corral earrings and watches, a lamp that's easy to switch on and off. If you know your guest likes a nightcap before retiring, you might even provide a glass, an ice bucket and a small bottle of his or her libation of choice. 6. Something to drink. Provide a water glass for taking pills and quenching a midnight thirst. A small carafe filled with fresh water is also a nice touch.7. Things that go bump in the night. Help your guests find the bathroom late at night without waking everyone in the house by leaving a nightlight on between the guest room and the bathroom.And speaking of waking everyone in the house, one night spent in your guest room may reveal some quirks you didn’t know your house had. Dining Room: Lamp shade style and scale for antique lamp. I recommend a drum shade. Simple. Linen or fabric covered. This bedside display uses the A rule (grouped together, the objects roughly follow the letter’s shape).